Royal Medical Solutions presents RMS Premium Hip Kit which is designed carefully by medical professions for people who are recovering from hip or knee surgeries. 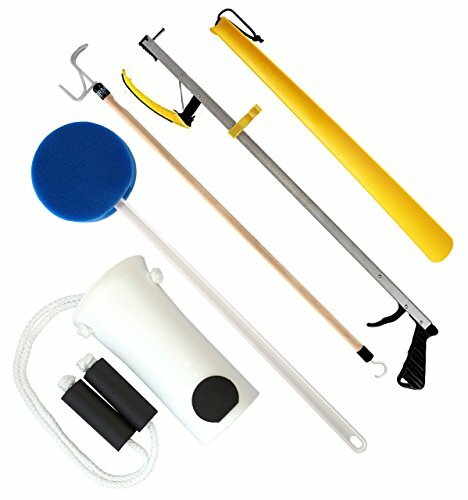 The Kit contains: one 26" Reacher, one Deluxe Molded Sock Aid with 38" Long Foam Handles, one 28" Long Dressing Stick, one 22" Long Handle Round Sponge and one 24" Long Plastic Shoe Horn. 100% satisfaction guaranteed! EXTEND YOUR REACH: Features RMS 26" Long reacher grabber built up with lightweight aluminum with ergonomic handle for comfortable grip. Magnetic tip helps pick up small objects and Fitted with post to assist with dressing. Yellow clip fastens reachers to canes, walkers, wheelchairs and hospital bed rails to keep them nearby. DRESS INDEPENDENTLY: 28" Dressing Stick with a large vinyl coated "S" Hook to assist with putting on shirts, pulling up pants, skirts, or helping put on shoes or removing socks. Vinyl coated "C" Hook on opposite end for pulling zippers and shoelace loops. The Sock Aid allows to easily put on socks or stocking without bend over. A 24" long shoe horn is included to easily put on any type of shoe while standing. MOST OFTEN RECOMMENDED BY THERAPISTS for post hip or knee surgery patients. RMS LIMITED LIFETIME WARRANTY. 100% satisfaction guaranteed!